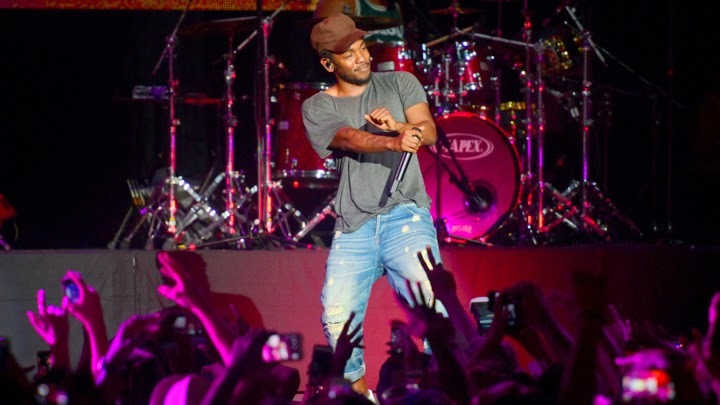 Kendrick Lamar has released "i," the first single from his as-yet-untitled upcoming record. The track begins with a rousing voice calling Lamar "a brother who stands for something" before the guitar line from the Isley Brothers' 1973 soul hit "That Lady," kicks in. Lamar's raspy voice raps about perseverance in the face of chaos until he lets loose the tune's uplifting chorus, "I love myself," while the song interpolates funky jazz bass before topping out at the 4:20 mark. It's the first single that the rapper has put out as a lead artist since his 2012 breakthrough record, Good Kid, m.A.A.d City. Lamar has yet to announce when he will release his next album. Lamar first teased the single in mid-September when he issued its cover art, depicting two men seemingly dressed like a Blood and a Crip with their hands forming the signs of hearts, rather than gang symbols, alluding to the song's message of unity. Producer Rahki tweeted that he produced the single, shortly after the artwork came out. Dangeroo Kipawaa, the CEO of Lamar's label Top Dawg Ent., tweeted about the tune's message, "I gotta respect the young man for using his platform to say something in music, not letting a gimmick or industry standards dictate his message." He also summarized the purpose of the single in another tweet, "This song is for man." Although Lamar has had no new music of his own to promote this year until now, he's found plenty of ways to keep busy. He appeared with Imagine Dragons at the Grammys in January to combine his own "m.A.A.d City" with their "Radioactive" for a memorable performance, though he ended up losing the Best Rap Album trophy to Macklemore and Ryan Lewis.Macklemore Instagrammed a text he sent Lamar saying that he felt the rapper was robbed, with Lamar noting he was grateful for the acknowledgement. Later in the year, Lamar covered Tupac Shakur's "California Love" at the iHeartRadio Awards in May and appeared at the Made in America festival in September. Most recently, the rapper appeared as a featured performer on "Never Catch Me," a track by electronic-music experimenter Flying Lotus.